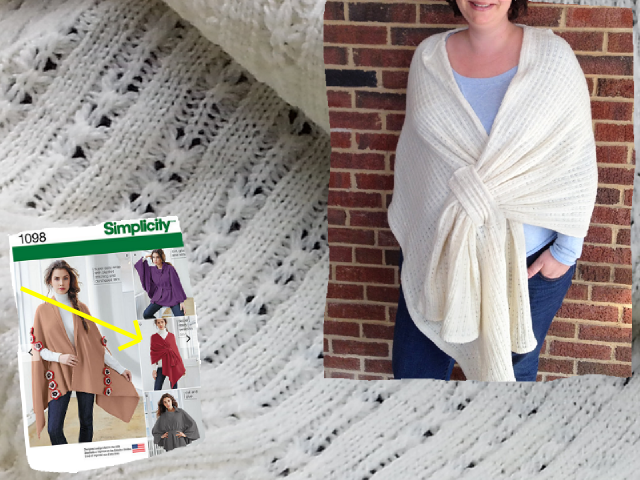 In Part 2 Maggie takes us step-by step through the making of her shawl, modifying the sewing of Simplicity 1098 view C [Amazon affiliate link] for use with sweater knit fabric. Missed Part 1? You can read it here. To begin, after cutting my pattern pieces from the Westerly wool sweater knit, I cut several 1" strips of Easy-Knit interfacing. I fused strips of interfacing around all the edges of my pieces to stabilize them and keep them from stretching as I handled the fabric. I used my iron on a wool setting and a damp pressing cloth. While this did shrink the fibers a bit, I feel that it also made them a bit denser and easier the sew, and the resulting shrinkage is not noticeable on the finished shawl. The next step was to sew the two main pattern pieces together. To attach the pieces I used a zigzag stitch to allow for a little stretching and movement, as the seam falls in the middle of the shawl and will likely experience some pulling and stretching. Next, I sewed the dart in each piece using a straight stitch. To avoid the “bubble” that you sometimes get when finishing off a dart I did not backstitch, and instead tied off the ends. Now it was time to finish the seams. I did quite a bit of experimenting with this step. I played around with a blind hem, which I am a huge fan of, but ultimately found the finished product to be a bit bulky and it was difficult to keep the fabric I was working with running in a straight line as I sewed. So, I decided to stick with what I know and use a double needle and straight stitch. I folded the stabilized hem in half, making a ½" seam allowance and pinned. I was a little nervous about not catching the hem underneath, but only had an issue in one spot at the curve around the collar which was easy to fix. Another idea I flirted with was mitering the corners of the shawl, which I think would have given it a nice, smooth look on the corners. However, after a little experimentation I decided that for my first project, it was just a little bit too much to try for. 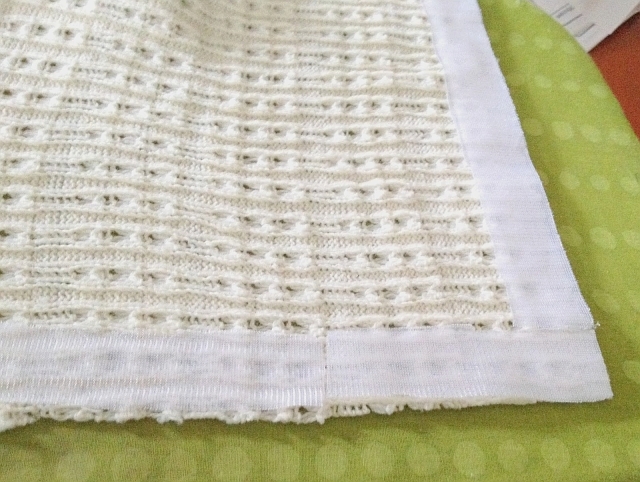 Instead, I took a look at some of the blankets I have around the house and studied how their corners were finished. I decided that trimming the corners and folding them over, while not the prettiest finish on the inside, would be a good idea for this first go round. I must say that while my finishing technique won’t win any awards, it’s not bad for a first try and I don’t think anyone else would ever know the difference. The last step was to attach the loop to the front. To do this, I interfaced the long ends of the fabric piece and sewed them at a ½” seam as I did with the main pattern pieces. To attach it to the shawl, I folded the short ends under and sewed it again with the double needle and straight stitch. I chose this method again because this piece will be pulled and tugged on quite a bit, and I wanted to use a stitch that would look nice from the outside but also have some stretch and give. And that's it! The beauty of this project is that it is so simple, yet so lovely when finished, and be easily be dressed up or down. It makes a great first time project as it is only a few pieces, there is no sizing involved and you will be introduced to a few different techniques that you can use in the future. So, if you have never tried sewing with sweater knits and want to give it a try, this is great place to start!